Push Advertising: What It Is and Why It's Beneficial for Your Business - Flottman Company. Push ads are the opposite of what marketers call “pull advertising.” Push advertising tactics like custom content and search engine optimization inform and gently guide consumers toward your services. Push ads, on the other hand, interrupt what a person is doing so they have to stop and notice your company’s bold, beautiful message. As much as Flottman Company is an industry leader with inset printing, miniature folding and inpackage marketing, their marketing department Fusionwrx has established a niche in push/pull advertising and marketing. Push advertising, while somewhat intrusive, is highly effective. If your company hasn’t experimented with it yet, you’re losing valuable opportunities for customer conversion. To help get you started, we’ve created a basic guide to push ads in both print and digital formats, and we’ve explained the benefits of both. 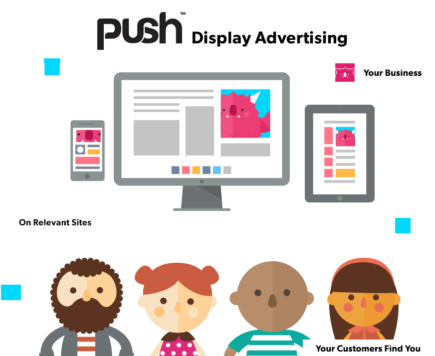 Read on to learn how push advertising could transform your business. Print advertising isn’t dead-it’s adapted to the new market and new technology. In the digital age, print focused marketers started producing promotion-heavy, eye-catching push ads that you see when you’re walking down the street, driving on the highway, and flipping through a magazine. Here are two print examples of push ads that work. Marketers use flyers, also called leaflets, to promote a specific event to a wide audience. Think about the concert flyers that promoters hand out in the street or put under your windshield wiper. Even if you immediately recycle the paper flyer, you still notice the event that it advertises. You decide as soon as you see it whether or not you’ll go to the event. When you market with flyers, you get a lot of bang for your buck. These economical forms of collateral grab an audience’s attention with strong, catchy headlines that attract customers immediately. Magazine and newspaper sales took a dive in the mid-2000s. As a result, many publications cut how many issues and pages they produce. Print-savvy marketers stepped up to the plate, creating better, more engaging magazine ads. Magazine ads very effectively reach a target demographic. If you’re selling winter outterwear, for example, then you want to push information about your product to an adventurous, nature-loving audience. Your marketing team can create a memorable, interesting ad, and you can purchase ad space in a customer-targeted magazine like Outside Magazine. Your brand reaches the right audience with the right message, and your product sells. Your modern consumers spend a large amount of time on smartphones, tablets, and computers. It’s tough to wrest their attention away from what they’re enjoying on their devices. Enter digital push ads, which capture people’s attention as they use their electronic devices. Here are two digital examples of push ads that you should try. Text message campaigns allow you to send up-to-date product and service information right to your audience’s inbox. You need to obtain your customers’ permission before you can start sending, but many companies simply use previous purchases as a way to ask readers for this permission. Text message campaigns work because they provide direct information about limited-time offerings like clearance sales. These messages can even be triggered to send when the individual is within proximity of your business. Starbucks is one of the best at this technique. Try walking past a Starbucks kiosk at any airport and prepare to be invited to grab a latte before your flight. Banner ads are among the best ways to increase visibility about your products and services. Banner ads usually span a section of a web page. Many of them are like a digital version of a newspaper-style print ad. Others include an embedded link to the service they are advertising. Either way, their main function is to generate traffic to your company’s website. As people view webpages via their smart phones, they can share mobile ready advertising that can connect via search on specific content site visits. Before you plan next year’s marketing campaigns in strategic planning meetings, reread this quick guide about the benefits of push ads. Flottman Company can help your business create one-of-a-kind print ads, including commercial folding and insert printing. Discuss your goals with our in-house marketing and design team. To set up your appointment, email us today at info@nullflottmanco.com.